Replica of the german Walther PPK, tha Blank firing pistol Kimar Lady is a small weapon, compact and discreete, perfect for women or small sized hands. But it is an afficient self defense pistol, that can be used with blank (bisy), gas (incapacitating gas), or flash (glaring) ammos, and can also shoot rubber ball with a Self Gomm adapter (not provided). Compact declension of the Walther PP (Polizei Pistole), the model PPK (Polizeipistole Kriminale) was ussed during the Word War II byt the german police, the Luftwaffe, and also oficials of the Nazi party. Adolf Hitler would have killed himself with its PPK in its bunker. 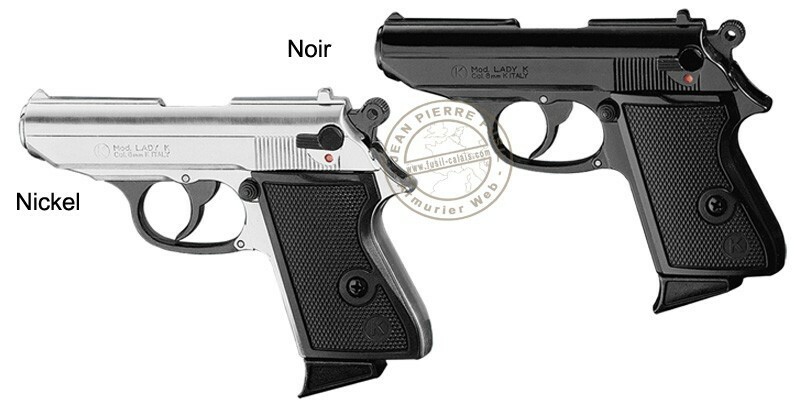 This pistol also owes its fame to Ian Flemming, whose hero James Bond has often used a PPK. The Kimar Lady pistol is an italian replica of this PPK, thus named because of its compactness, that really suits womanhood. Made of alloy (Zamak), the Lady is a light but balanced pistol, robust on time. The grips are made of black squared plastic. The Kimar Lady is a semi-automatic pistol, in 9mm PAK blank bore, with a 5-shots magazine.